Kramer’s celebration of the titular locale as shorthand for the magnificent bastion of American popular songcraft that conquered the charts in the wake of rock 'n roll, this collection finds the jack-of-all-trades casting songs from that inspired age in light equally glorious and ludicrous. Continuing a decade-plus run on New York's experimental Tzadik Records, 2012 saw Kramer release a project seven years in the making. 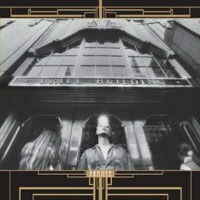 In "Book One" of what is presumed to become a series, he offers ten exquisitely selected cuts sourced from the last golden age of pop songwriting-for-hire, when most of the American music industry's affairs were carried out in and around the concentrated hub of Uptown Manhattan's Brill Building. It's true the magic that was conjured there during that brief spell during the early 1960s has been widely (albeit sporadically) recorded, but there are few all-out celebrations of the multi-faceted scene quite like this one. Contrary to the spirit in which the songs were first imagined, The Brill Building is almost entirely performed and produced by Kramer himself, who strikes a characteristic mood of whimsical reverence. In a sense, by melting these songs down and reforming them in his own image, he counteracts the delicate balance of intense competition and collaboration inherent to their original formation. Still, this set inextricably fosters admiration for those whiz kids who conceived the words and music. In giving most of the famous songwriting partnerships their due, it is tellingly inevitable that Kramer's selections also gravitate towards material which passed through the hands of producer extraordinaires Jerry Leiber, Mike Stoller, and Phil Spector, who are in one way or another tied to the majority of these compositions. Starting off with an eerie whistle on the Crystals' originally trepidatious "He Hit Me (It Felt Like A Kiss)", Kramer's take on the twistedly groundbreaking Gerry Goffin/Carole King number is ultimately less tempestuous and much more playful. It's precisely the song's already subversive qualities that make what at first seems like a strange choice for an opener actually meld pretty well with Kramer's skewed ethic. The result is willfully bizarre, yet pays off in a remarkably affective piece. The same could be said for the album at large, of which the dramatic lyrical climax of "He Hit Me" works as an encapsulation: "He hit me / And made me his". He follows by playing up the camp on the stupendously silly Barry/Greenwich tune "Do Wah Diddy Diddy", sounding like a cartoonishly gruff Captain Beefheart duetting with Elmo. Kramer continues rotating between radically different voices for practically every track, making another about-face for his languid "Baby It's You", which couldn't be more sublime. Likewise, Barry Mann's lovely "I Love How You Love Me" is given a rightfully gorgeous rendition set to loping piano-laden accompaniment and pizzicato strings. This album isn't the only time Kramer has visited the Brill Building, having covered Goffin/King's latter-day gem "The Porpoise Song" in an outtake from Bongwater's Double Bummer, the same record that featured a Mandarin language rendering of Led Zeppelin in "Dazed and Chinese". It should come as no surprise then that he turns around here and does Neil Diamond's "Cherry Cherry" in Spanish, which actually gives him an excuse to play it pretty straight with the rest of the arrangement. In fact, considering Kramer's past tendencies, his productions are markedly accessible and play around in generally inventive ways. He speeds up songs that were traditionally measured and slows down those that were snappy in the first place. He doubles down on the ethnic incongruity already manifest in Ben E. King's performance of "Spanish Harlem" by transforming it into cut-time western swing, and later re-imagines Doc Pomus' "Last Dance" as a rapid polka with the help of famed sideman R. Stevie Moore. After the jazzy excursion of "On Broadway" comes a superb finale: "Paradise", one of several lesser-known mid-60s collaborations between Phil Spector and a young Harry Nilsson. Along with vocalist Daniel C. Smith, Kramer channels the majesty that the song and its soaring chorus naturally call for, deftly conjuring a tone of mounting triumph. His hallmark use of found-sound dialogue snippets helps to integrate the record into a surprisingly cohesive whole, surfacing mostly between songs and themed around topics like President Kennedy's assassination, race riots, and Vietnam-- events which helped bring about the end of the cultural era that the Brill Building in many ways symbolized. Granted it's hopelessly loopy at times, but this collection comes off above all as a labor of love, and may well be "his greatest CD ever" as the disc's OBI strip proclaims. Perhaps the best testament to the monumental contribution of those youthful songwriters is that their work, initially aimed at the teenage market, can be dramatically refashioned by a gleeful deviant like Kramer half a century later and still wind up being equally of its own accord.